Lucas grabs hold of this wild opportunity to run away—even for a few precious days—from the gilded cage that is his carefully managed life. He’s just looking for a little fun and freedom as a normal person. From roller coasters to a college football game, Brandon begins to see the real Lucas Black buried under the famous persona. But by the time he and Lucas discover their mutual attraction, they only have one night left before both of them have to go back to their real lives. The fun is over…unless Lucas can run away for real this time and keep their adventure going. This series is reminding me of the Harlequin Series I read when I was … let’s say a long time ago 😉 . Even though this is a short story, you will find yourself enjoying every word of it. 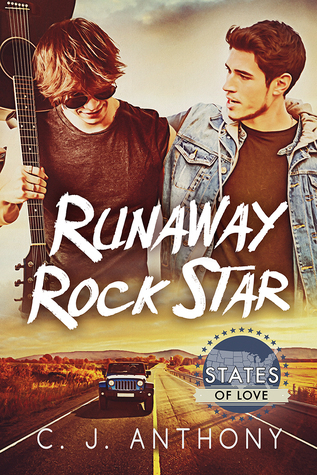 The story takes place in Ohio, where the data entry Brandon, who works for a Rock and Roll museum, is asked to give a private tour to the spoiled rock star: Lucas Black. Brandon is not a fan of Lucas. In his opinion, Lucas’s music is cheap and commercial. But his boss is warning him, that he must give the million-dollar tour, in order to have the young star glowing in the dark guitar. As Brandon expected, Lucas is a spoiled brat. When he arrives with his manager following him, he has the attitude of every star. Lucas seems bored out of his mind, so Brandon gives him the five-cent tour, keeping on his fake smile. But when Lucas, in a very rude manner, sends his manager out of the museum, his attitude is changed a bit, and he talks about rock legends with awe. At the end of the tour, Brandon is stunned when he got invited to the backstage of Lucas’s concert. His boss’ death stare gave him no other option but to accept the invite. After the concert, Lucas invites him in his room and asks him a favor, a favor Brandon will learn to like it very much. Not at the beginning though. Lucas asks Brandon to take him to Cincinnati, the next city on his tour. Lucas is not an easy travel companion, and he has his plans. But then Brandon comes to know Lucas more, and the more he learns about this very beautiful, young man, the more he can’t refuse his requests. I loved every bit of this story, from the very begging to the last word. If you are looking for a funny, quick read, this is the book you are looking for!